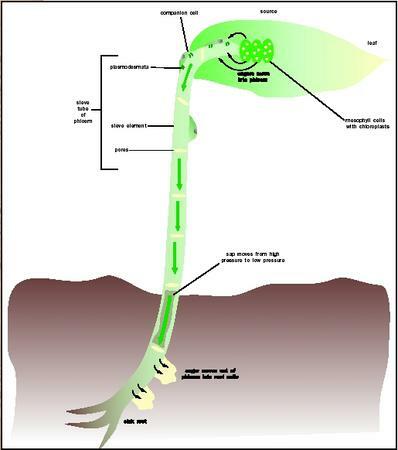 Translocation is the movement of materials from leaves to other tissues throughout the plant. Plants produce carbohydrates (sugars) in their leaves by photosynthesis, but nonphotosynthetic parts of the plant also require carbohydrates and other organic and nonorganic materials. For this reason, nutrients are translocated from sources (regions of excess carbohydrates, primarily mature leaves) to sinks (regions where the carbohydrate is needed). Some important sinks are roots, flowers, fruits, stems, and developing leaves. Leaves are particularly interesting in this regard because they are sinks when they are young and become sources later, when they are about half grown. The tissue in which nutrients move is the phloem . The phloem is arranged in long, continuous strands called vascular bundles that extend through the roots and stem and reach into the leaves as veins. Vascular bundles also contain the xylem , the tissue that carries water and dissolved minerals from the roots to the shoots. When plants increase in diameter (secondary growth) they do so by divisions of a layer of cells just under the bark; this cell layer makes new xylem to the inside (forming the wood of the tree trunk) and a thin, continuous cylinder of new phloem to the outside. The contents of the phloem can be analyzed by cutting off the stylets (mouth parts) of phloem-feeding insects such as aphids and collecting the drops of sap that exude. Phloem sap is composed largely of sugar dissolved in water. All plants translocate sucrose (table sugar) and some also transport other sugars such as stachyose, or sugar alcohols such as sorbitol. Many other organic compounds are found, including amino acids , proteins , and hormones . Glucose , the sugar found in the circulatory system of animals, is not translocated. In order to accommodate the flow of sap, the internal structure of the conducting cells of the phloem, the sieve elements, is drastically altered. As the sieve elements mature, they lose many of the organelles commonly found in living cells and they modify others. The nucleus disappears, as do the vacuoles, microfilaments, microtubules, ribosomes , and Golgi bodies. Therefore, the inside (lumen) of the cell is left essentially open. The sieve elements are greatly elongated in the direction of transport and are connected to one another to form long sieve tubes. Large pores perforate the end walls of the sieve elements to facilitate flow through the tube. The connecting walls thus look like a sieve, giving the cell type its name. Some sieve elements can live for a long time, as many as one hundred years in palm trees, even though they have no nucleus or any of the machinery needed for protein synthesis. Cells closely associated with them, called companion cells, apparently keep them alive. The association of sieve elements and companion cells is one of the most intimate and complex in nature, and one of the least understood. It now appears that both small and large molecules can move from companion cells to sieve elements through the plasmodesmata that connect them. Plasmodesmata are minute pores that traverse the common walls between plant cells. They have an intricate internal structure. Interest in plasmodesmata is high because viruses move through them to cause infections. If a virus enters the phloem this way it will travel with the sap, spread widely around the plant, and infect sink organs. Since viruses are much larger than plasmodesmata, they must be disassembled in one cell and reassembled when they get to their destination. Sugars synthesized in the chloroplasts are actively pumped into the sieve tubes. Water follows by osmosis, creating high pressure. Sugar is then removed by active transport, and water again by osmosis, lowering the pressure in the sieve tube. The rate of translocation in angiosperms (flowering plants) is approximately 1 meter per hour. In conifers it is generally much slower, but even so this is far too fast to be accounted for by diffusion. Instead, the sap flows, like a river of dilute syrup water. What is the force that drives the flow of material in the phloem? It is pressure, generated in the sieve elements and companion cells in source tissues. In leaves, sugar is synthesized in mesophyll cells (the middle layer of the leaf), and is then actively pumped into the phloem, using metabolic energy. By using energy, the sugar is not only transferred to the phloem but is also concentrated. When a solute such as sugar is concentrated inside cells, water enters the cells by osmosis . Since the plant cells have a rigid cell wall, this influx of water creates a great deal of internal pressure, over ten times the pressure in an automobile tire. The pressure causes sap to move out through the pores of the sieve element, down the tube. At the other end of the transport stream, in the sinks, sugar is constantly leaving the phloem and being used by surrounding cells. Some is consumed as an energy source, some is stored as sugar or starch, and some is used to make new cells if the sink tissue is growing. Since sugar leaves the phloem in the sink, water exits too (again by osmosis) and the pressure goes down. Therefore, there is a difference in pressure between source and sink phloem. This causes the solution to flow, just as water flows along a pressure gradient in a garden hose. This process is known as the pressure-flow mechanism. How is sugar actively pumped (loaded) into the phloem? There are two known mechanisms, operating in different species. In one, sucrose enters the cell walls near the phloem in the smallest (minor) veins of the leaf. It then enters the phloem by attaching to sucrose transporter proteins embedded in the plasma membranes of the sieve elements and companions cells. In the second mechanism, sucrose enters the companion cells of the minor vein through small plasmodesmata, and is converted to larger sugars, raffinose, and stachyose. These larger sugars are unable to diffuse back through these plasmodesmata due to their size. Therefore they are trapped in the phloem of the leaf and build up to high concentration. They enter the sieve elements through larger plasmodesmata and are carried away toward the sinks. When sugars and other nutrients arrive in sink tissues they unload from the phloem and enter surrounding cells, either through plasmodesmata or by crossing from one cell to another across the cell walls. The size and metabolic activity of the different sinks determines the amount of material that is delivered to them. Thus, the use of sugar in the sinks determines how much sugar flows to them. Oparka, K. J., and Richard Turgeon. "Sieve Elements and Companion Cells: Traffic Control Centers of the Phloem." Plant Cell 11 (1999): 739–750. excellent for knowledge searcher.i have seen it and happy by seeing such webs. This was so helpful i have a bio test tomorrow and i feel really prepared because of this. Thanks!!! Excellent biological knowledge. i have finally understood the concept of trans location.